There are many ways to earn links from the web through direct and indirect efforts. Direct effort refers to link building strategies, such as document sharing, guest posting, social media marketing, press release publishing and more. The indirect effort is gained from presenting excellent content on your site that causes readers to share it around the web, linking the pages naturally. The link equity that passes from these sites to your site is the link juice, and this link juice differs in its authority depending on the sites linking to you. Suppose you have sites A and B. If all other ranking factors are constant and site A has one link while site B has no links, site A will rank higher in search results due to the link juice it receives from the external site linking to it. What happens if site B also gains one link? This depends on the amount of juice each link passes. Look at the diagram below. Site A receives links from four sites while B receives links from two sites. All the linking sites receive link juice from other sites too. Since A receives links from more sites, there is more link juice being transferred to A and consequently, A is likely to rank higher than B in search results. Note: These results assume the sites linking to A and B have a similar authority. Another factor to consider is that passing link juice happens in both directions. So, now let us say that the sites linking to site A all also link to other sites too (represented by the grey arrows in the diagram below), whereas the sites linking to site B exclusively link to B. In this case, the percentage of link juice that B receives is higher than the percentage of link juice site A receives. This increases site B’s chance at ranking higher than site A. 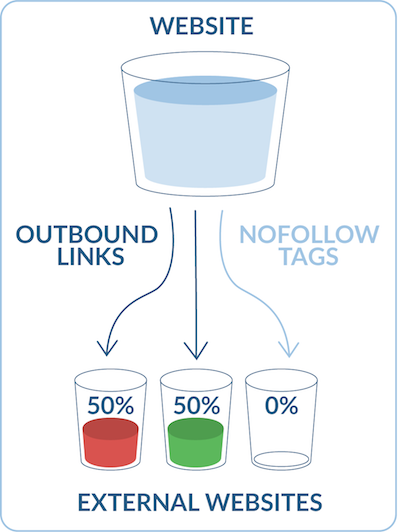 You used to be able to use nofollow links to preserve the loss of link juice through outbound links. This process was known as PageRank sculpting. This was to manipulate the way link juice moved from the page. 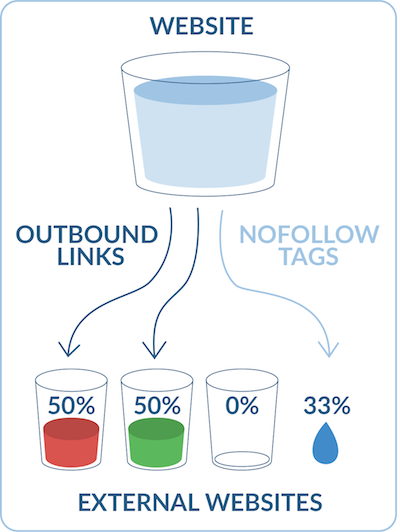 In the first diagram, you will see that with dofollow links (links that are not nofollowed) the transfer of link juice is equally distributed to all the outgoing links from a website. PageRank sculpting was possible when a webmaster added a nofollow attribute to one of the outgoing links, which meant that the link juice would not transfer to the page that is nofollowed but would be distributed to the other links. This is demonstrated in the diagram below. This is no longer possible. You can see in the next diagram that the site distributes its link juice to all three sites equally, the difference is that the nofollowed link doesn't receive it. Since this is the case, you may be worried about the dilution or leaking of link juice from your home page to nofollow links on your footer or sidebar. A good and widely used practice is to stop the flow of link juice to spam comments and links posted on blogs with a nofollow attribute. On the contrary, when it comes to internal links on a site, it is a good practice to allow a natural flow of link juice rather than controlling it with nofollow attributes. The link juice obtained and distributed within your site keeps your inner pages popular on the web as well as your homepage. This collectively enhances the PageRank of your home page. Pages that have content relevant to your site. Pages that have a high PageRank. Pages that have relatively few outbound links. Pages that contain quality content. Pages that appear high in SERPs. Pages that have user-generated content. Pages that are popular with social media audiences, i.e. they are mentioned often in social media. Pages that have nofollowed the link to your site. Pages that have a lot of links; for example, ad links or site-wide links. Pages that are not indexed in search. Links from unranked sites with no content. One often-overlooked source of potential link juice is your site. 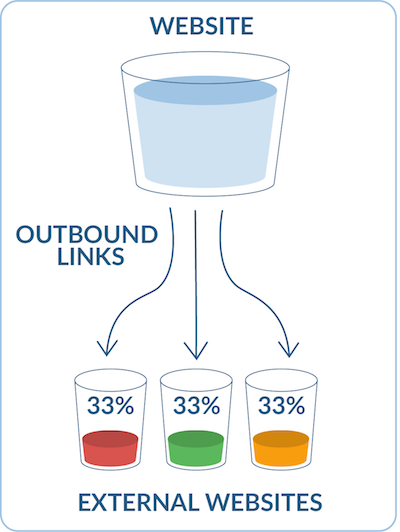 In a relentless pursuit of high-value backlinks, many marketers miss pools of link juice concentrated on their most popular pages. Chances are, you’ve got a reservoir of value you can pass on to your internal pages, waiting for you to tap into through internal linking. SEO Review Tools: This is a robust tool that finds both domain and page authority for a URL. It will also tell you the total number of external links pointing at your page. Use the Link Checker tool to find the URL, anchor text and authority information for your external links. They also have a bulk authority checker that lets you look up ten pages at a time. Small SEO Tools: A free tool that scores domain and page authority of submitted URLs out of 100. Open Site Explorer: This is a free tool by SEOmoz. You can get Moz’s Domain Authority, Page Authority and inbound links for your page. When you’ve assembled your lists of target keywords and high authority pages, it’s time to drain the link juice. Place links to your target page using your keywords as anchor text. Be careful to avoid hyperlinking only your keyword exact matches as this could end up looking spammy to a search engine. Use synonyms or latent semantic keywords (LSI keywords) when possible. Finally, you need to remove any unnecessary outbound links from your pages. As we mentioned above, the amount of value a page can pass is divided equally among the total number of links on a page. You can use the rel="nofollow” tag to avoid passing link juice, but you can’t use it to increase the amount of equity passed by other links on the page. You can find the number of internal links on a page in Google Search Console under Search Traffic. Many marketers and website owners overlook pools of link juice already acquired by pages. 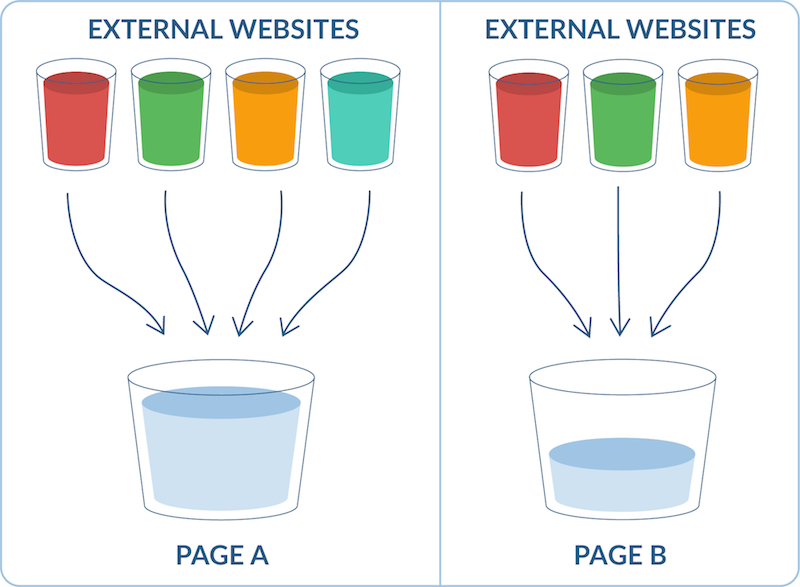 There's an excellent chance you've got reservoirs of link juice on your site that are just waiting to be tapped to distribute value to other pages. To optimize your internal linking for a particular page, come up with a list of keywords and LSI keywords relevant to the page's content and other pages relevant to that content. You can use the site: and intext: search operators to find that content. Add links to your target page in the top pages in those search results (obviously, ignore any pages that aren't actually relevant). It might be tempting, but don't use the same keyword-rich anchor text every time. This could wind up looking spammy to Google. Consider removing less relevant links from those high-value pages to avoid diluting the link juice too much. Check My Links is a super useful plugin to find the links on a page. Link building has been a vital part of search engine optimization from the very beginning. External links can be one of the most important, if not the most important, ranking factors for search engines. Each external link to your domain is a third party statement that your site has something relevant and valuable for users. This means that search engines see the link juice passed through external links differently and take that into account when ranking pages in search results - Google’s PageRank algorithm is probably the most famous instance of this. So how do you go about building backlinks for your site? This may seem like a daunting task as it’s largely out of your control. But there are a few steps you can take to make your outreach a little easier and more likely to result in backlinks. Sites that target audiences in different countries may localize or translate their content to make it suitable for all of their users. The hreflang tag provides search engines with a signal, pointing them to different versions of each page, helping them to return the most appropriate version depending on the user's language or location. Hreflang tags also allow the sharing of link juice between pages and their equivalent localized versions, providing a good foundation for these pages to rank in their local search engines. You can read more about this in our guide How to Use hreflang for SEO. It's also possible to add hreflang tags to your XML Sitemap, giving a single file to direct search engines to all pages and their associated translated/localized versions. You can read more about this in our XML Sitemaps guide. Link reclamation is the process of finding and fixing old links pointing to your pages. Use a crawler like Site Crawl or check Google Search Console's Index Coverage report to find URLs that return a 404 status. You can use a tool like Ahrefs to find links to that page. From there it should be as easy as providing an updated URL to the website owner (they don't want a dead link on their page either). Don't redirect these links to your homepage or another unrelated page. They can cause Google to see your homepage as a soft 404 and affect your site's conversion rate. Despite these implications, it's a surprisingly prevalent problem for some websites. Check out our guide on link reclamation for more tips on recovering link juice. Note that you can sneakily use link reclamation to claim a competitor's old link for yourself. One of the most effective ways to generate more link juice for your SEO is to create content that's worth linking to. Yes, easier said than done, but don't worry! You don't necessarily have to start from scratch. It's called the skyscraper technique. Expanding it: So-called listicles are very popular and can get a lot of shares. Create a larger and more comprehensive list — turn a top 10 into a top 20 — and pitch it to your audience. Or, add additional details and examples. Updating it: Depending on your particular niche, content goes out of date all the time. Updating a piece of content with the newest information will make it much more useful and linkable. Beautifying it: Users prefer visual elements, especially when it comes to data-heavy topics. Infographics are super shareable. Take content that is a little ho-hum or data-heavy and add quality visual elements. Once you've spruced up the content, share it with your audience across social media. Engaging your audience encourages sharing and links. For a full look at the skyscraper technique, read the guide by the guy who pioneered it. Already linking to content similar (but obviously inferior) to your own. BlogDash: Find bloggers in your niche and, importantly, their contact information and what they’ve recently written about. AuthorCrawler: Built by Distilled’s Tom Anthony, AuthorCrawl finds links to a page and crawls them looking for author markup to display their Google+ information. The tools uses the SEOmoz API for the linking blogs Page and Domain Authority. When doing outreach for backlinks, start by establishing the value of your content. Check your target page for broken links that you could replace. The Check My Links extension is a great tool to find invalid links that could be redirected to your URL. Lead with your added value. Bloggers probably aren’t interested in reading something they’ve already read or written about. Instead, start off by telling them how your article will fill in a gap they missed in their previous blog post. Don’t copy and paste URLs directly into the email. Even if you do this manually it will look like you used software that pulled the information from an Excel spreadsheet. Try hyperlinking to the blog post or even leaving out the URL entirely. Authors probably remember the post they recently wrote. Use a unique subject line. If you’re trying to contact a popular, authoritative blog, you’re likely competing with dozens, or even hundreds of people for their attention. If your email subject reads like a form letter or like you’re doing blogger outreach, it will likely end up getting deleted unopened. Make your email subjects specific enough that the recipients will know the topic you’re writing about, but vague enough they won’t know you’re hitting them up for links. Include your personal contact information. This will add to your credibility and make your email look less spammy. Above all else, make sure your outreach emails contain some personal touches. People can tell when they are reading form letters and you risk leaving a bad taste in their mouth which could impact future outreach efforts. You may find that you only get a response from a small percentage of the bloggers you reached out to. Don’t be discouraged. Remember: you contacted these bloggers because they had a large audience and high authority. This means that when it comes to value passed by their links, a little bit can go a long way. Remember that link juice is important because it's really a way to measure how people are discussing your content, website and brand. Yes, link juice is really important to your Google rankings. But it's also a great way to build brand awareness, build your reputation and establish yourself as a resource in your niche.